Sonar AS, Sonar Q, and Sonar RTU. 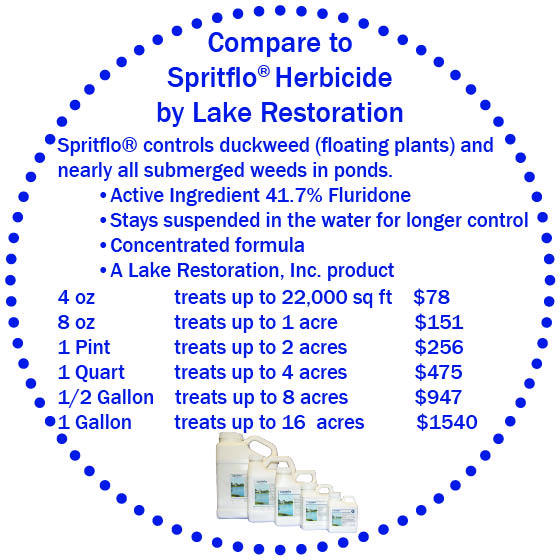 Compare Sonar AS to our Spritflo® fluridone herbicide. Sonar® AS is a liquid aquatic herbicide that controls pondweed, duckweed, hydrilla, and other undesirable aquatic weeds. 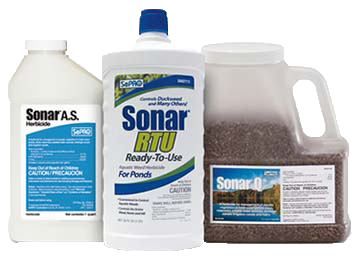 Sonar® Q is a granular aquatic herbicide used to control persistent aquatic weeds. The granular version is best used to spot treating areas with submerged weeds. Sonar® RTU is a ready-to-use liquid aquatic herbicide. There is no mixing, simply apply directly into the water to control your floating and submerged weeds. Spritflo™ Fluridone Herbicide is equivalent to and a direct substitute for Alligare Fluridone and Sonar AS Liquid, for Less! For a more complete solution, we recommend pond weed control products to keep your pond looking as intended. Sonar® AS is available in 8 oz, 16 oz (Pint), 32 oz (Quart), and 128 oz (1 Gallon) sizes. Sonar® Q is available in 8 Pounds and 40 Pounds Containers. Sonar® RTU is available in 32 oz (Quart). My wife and I had agonized over our "ugly" pond for several years before we finally decided to spend the cash and hope for the best. We went with the sonar because we had a severe miliweed / milifoil ? problem. Our big problem is that our neighbors pond overflows into our pond and they have the same problems. We treated our pond and over the course of several weeks we noticed a big difference. The kicker is I'm writing this review about 4 years later and our pond is still in great shape which I find incredible. Our miliweed is still almost non existent even with the overflow, and the host of critters that go from our pond to several in the neighborhood. As a side note, over the summer months the neighbors pond is covered on top with the miliweed to this day. We are starting to get some of our spatterdock infestation back so it may be time to re up on something that will beat it back a bit. Overall, we were and still are thrilled with the products we ordered from lakerestoration.com. Thank you!